PM Modi took part in the G-20 Summit in Buenos Aires from 29 November -01 December 2018. The Prime Minister held talks with heads of other participating nations and deliberated on the situation of global economy and trade, international financial and tax systems, women empowerment, infrastructure and sustainable development. The JAI (Japan-America-India) trilateral and RIC (Russia-India-China) trilateral were also held on the margins of the G-20 Summit. PM Modi visited Singapore during 14-15 November, to participate in the ASEAN-India and East Asia Summits. During the visit, PM Modi delivered the historic Keynote Address at the Singapore Fintech Festival. The PM also attended the Regional Comprehensive Economic Partnership Leaders' Meeting. PM Narendra Modi took part in the 4th BIMSTEC Summit at Kathmandu on 30th and 31st August. The Summit focused on the theme ‘Towards a Peaceful, Prosperous and Sustainable Bay of Bengal Region.’ On the sidelines of the Summit, the PM held productive talks with several world leaders. PM Modi met PM KP Sharma Oli and reviewed India-Nepal bilateral relations. PM Modi and PM Oli also inaugurated the Nepal-Bharat Maitri Dharamshala at the Pashupatinath Temple Complex. From 25-27 July, PM Modi attended the BRICS Summit in South Africa. On the margins of the summit, the Prime Minister also hold bilateral meeting with the South African President and other leaders. PM Modi attended the SCO Summit in Qingdao, China. This year, India was inducted as a full member of the SCO. Discussions at the summit took place on diverse issues ranging from combating terrorism and extremism to promoting cooperation in connectivity and commerce. During his visit, the PM also held bilateral meetings with President Xi Jinping of China and several Central Asian heads of States. On 19th and 20th April, PM Modi took part in the Commonwealth Heads of Government Meeting. Discussions pertaining to several global and regional issues were held. The PM also met several Heads of States on the sidelines of the Meeting. PM Narendra Modi visited Washington DC on 31st March. He participated in the 4th Nuclear Security Summit. PM held discussions on the crucial issue of threat to nuclear security caused by nuclear terrorism. On the sidelines of the summit, PM Narendra Modi met several world leaders to carry forward the agenda of bilateral cooperation with those nations. Shri Modi also interacted with the scientists associated with LIGO project. PM Narendra Modi visited Brussels on March 30. Shri Modi met and held talks with Belgian PM Charles Michel. He held the 13th India-EU Summit with the E.U. leadership. PM Modi and Belgian PM Michel also remotely activated the India-Belgium ARIES (Aryabhatta Research Institute for Observational Sciences) Telescope. Shri Modi met Members of European Parliament (MEPs), Indologists, Belgian CEOs and Board Members of the Association of Diamond Traders. Shri Modi also interacted with the Indian community. The visit was aimed at expanding trade, investment and high technology partnership with Belgium. India hosted the 3rd India-Africa Forum Summit from October 26-October 29, 2015. It was one of the largest events as leaders and representatives from 54 nations of Africa gathered together under one roof. PM Narendra Modi welcomed the leaders, held bilateral meetings and deliberated upon strengthening India’s relationship with African countries in the times ahead. PM Narendra Modi attended G4 Summit hosted by India on the sidelines of the United Nations General Assembly in New York during his visit to the USA. It brought together heads of four countries under one roof. Chancellor Angela Merkel of Germany, PM Shinzo Abe of Japan, President of Brazil Dilma Rousseff and PM Modi together pressed for urgent reforms in the UN Security Council. PM Narendra Modi visited the Republic of Korea at the invitation of President Moon Jae-in. During this visit, PM Modi held crucial talks with President Moon, he met with business leaders and members of the Indian community. PM Modi visited Uganda during 24-25 July. The PM held productive talks with President Kaguta Museveni of Uganda and also delivered a Keynote address at the Parliament of Uganda. Shri Modi became the first Indian Prime Minister to address the Ugandan Parliament. During his first bilateral visit to Indonesia, PM Narendra Modi held extensive talks with President Joko Widodo and deliberated on ways to further enhance cooperation between both the countries in host of sectors. The Prime Minister also interacted with Indian community in Indonesia during his visit. PM Modi and President Putin of Russia held productive discussions and they reviewed the complete range of India-Russia relations as well as other global subjects during their first ever informal summit in the Black Sea coastal city of Sochi. The leaders also visited the Sirius Education Centre and interacted with session students. PM Narendra Modi visited Nepal for the third time on 11th and 12th May where he held extensive talks with PM KP Sharma Oli on ways to further deepen bilateral cooperation. Apart from Kathmandu, PM Modi visited Janakpur and Muktinath. PM Modi visited Wuhan, China on 27-28 April 2018 for an Informal Summit with Chinese President Xi Jinping. PM Modi and President Xi exchanged views on a range of issues of bilateral and global importance. The leaders reviewed the developments in India-China relations from a strategic and long-term perspective. PM Modi visited the Netherlands on 27 June 2017. He met Dutch Prime Minister Mark Rutte, called on King Willem-Alexander and Queen Maxima. The PM, in a meeting with CEOs of major Dutch companies, encouraged and invited them to explore opportunities in India. PM also interacted with Indian diaspora in the Hague. PM Narendra Modi visited Paris, France on 2-3 June. He held fruitful talks with President of France, Emmanuel Macron on 3rd June and discussed issues of mutual interest with a view to further strengthen India-France strategic ties. Shri Narendra Modi paid a historic visit to Mexico making it the first Prime Ministerial visit in three decades. Shri Modi held talks with President of Mexico, Mr. Enrique Peña Nieto and held wide-ranging talks to enhance bilateral relations between both the countries. PM Modi visited Republic of Rwanda during 23-24 July. This was the first visit by an Indian Prime Minister to Rwanda. He held bilateral meeting with President of Rwanda, held talks with business community. PM visited the Genocide Memorial and participated in an event on "Girinka” (one cow per family), a national social protection scheme of Rwanda personally initiated by President Paul Kagame. PM Modi’s Singapore visit was aimed at enhancing India-Singapore partnership in multiple sectors. During his visit, the Prime Minister met Singapore President Halimah Yacob, held talks with PM Lee Hsien Loong and interacted with the business community. Shri Modi became the first Indian Prime Minister to deliver the keynote address at Shangri-La Dialogue. PM Modi also visited Clifford Pier, where Gandhiji’s ashes were immersed in sea on 27 March 1948. PM Modi, during his bilateral visit to Sweden, held productive talks with Swedish PM Stefan Lofven. PM Modi interacted with leading business leaders. The PM also met His Majesty King Carl XVI Gustaf, King of Sweden. India and Sweden jointly organized the India-Nordic Summit in Stockholm on 17th April with the Prime Ministers of Finland, Norway, Denmark and Iceland. PM Narendra Modi’s visit to the UK was aimed at enhancing India-UK partnership in the areas of healthcare, innovation, digitization, electric mobility, clean energy, and cyber security. The PM held wide ranging talks with PM Theresa May. He met HM The Queen, interacted with leading CEOs of the two nations, launched an Ayurveda Centre of Excellence in London, and welcomed the UK into the International Solar Alliance, as its newest member. PM Modi visited Oman on 11-12 February. He met HM the Sultan Qaboos of Oman, Deputy PM for the Council of Ministers HH Sayyid Fahd bin Mahmoud Al Said and Deputy PM for International Relations and Cooperation Affairs HH Sayyid Asa'ad bin Tariq Al Said. The PM also interacted with Indian community at the Sultan Qaboos Sports Complex in Muscat, which is one of the largest in Oman. PM Narendra Modi visited the United Arab Emirates during February 10-11. This was his second visit to the UAE and the PM held meetings with HH Sheikh Mohammed bin Rashid Al Maktoum, the Vice President and Prime Minister of UAE and Ruler of Dubai, and HH Sheikh Mohamed bin Zayed Al Nahyan, Crown Prince of Abu Dhabi. The PM also be addressed the 6th edition of the World Government Summit in Dubai, where India was the Guest Country of Honour. PM Modi paid a historic visit to Palestine on February 10th after transiting though Jordan where he met HM King Abdullah II. In Palestine’s Ramallah, PM Modi met President Mahmoud Abbas. India and Palestine agreed to deepen ties in key sectors such as technology, training and infrastructure development. During his visit, the PM was conferred ‘Grand Collar of the State of Palestine'. PM Narendra Modi visited Myanmar from September 5-7, 2017. This was his first bilateral visit to Myanmar. PM Modi met H.E. U Htin Kyaw, President of Myanmar. Prime Minister held wide-ranging discussions with State Councillor Daw Aung San Suu Kyi on matters of regional cooperation. Giving a fillip to cultural ties between both countries, the PM also visited Ananda Temple, Shwedagon Pagoda, Kali bari Temple and Mazar of Bahadur Shah Zafar. PM Modi paid a historic visit to Israel from 4-6 July upon invitation of PM Netanyahu. It was the first ever visit by any Indian Prime Minister to Israel. PM Modi held wide-ranging talks with President Rivlin and PM Netanyahu. He interacted with Israeli CEOs and discussed scope of expanding businesses in India. He also visited Yad Vashem Memorial Museum to honour the memory of the victims of the holocaust. Shri Modi also interacted with Indian diaspora in Tel Aviv. Prime Minister Narendra Modi visited Washington, D.C. from 24-26 June. Prime Modi met President Donald J. Trump and held crucial talks on further consolidating the robust and wide ranging partnership between India and the United States. PM Modi met top American CEOs and invited them to invest in India. He also interacted with Indian community during his visit. PM Narendra Modi visited Portugal on 24 June 2017. PM Modi held talks with PM Antonio Costa and discussed ways to enhance the bilateral engagement, especially in the areas of economic cooperation, science & technology, space collaboration and people to people ties. Both the leaders also launched a unique Startup portal. PM also interacted with the Indian Community in Portugal during the visit. PM Modi visited Spain on 30th May on an official visit. He held a meeting with President Mariano Rajoy and discussed bilateral and other issues of mutual interest. As part of the programme, Prime Minister also met King Felipe VI of Spain. He joined Round-Table interaction with leading Spanish business leaders and invited them to explore opportunities in Indian market. PM Modi visited Germany from 29-30th May. PM held wide-ranging fruitful talks with Chancellor Angela Merkel and attended the 4th India-Germany Intergovernmental Consultations. PM and Chancellor Merkel jointly addressed a Business Event where top CEOs from both the sides were present. Prime Minister Modi also paid a courtesy call on President of the Republic of Germany H.E. Dr Frank-Walter Steinmeier. PM Modi visited Sri Lanka on 11th and 12th May 2017 where he joined Vesak Day celebrations. He interacted with leading Buddhist spiritual leaders & scholars. Shri Modi held wide ranging talks with President Maithripala Sirisena & PM Ranil Wickremesinghe & discussed ways to further deepen bilateral ties. He visited the Seema Malaka & Dalada Maligawa temples. Shri Modi inaugurated the Dickoya Hospital built with Indian assistance. He also had an interaction with Tamil community. PM Narendra Modi visited Vietnam to further cement the close bond between both countries. PM Modi held talks with Prime Minister of Vietnam Mr. Nguyen Xuan Phuc and the President of Vietnam, Mr. Tran Dai Quang. The PM also met several other leaders of Vietnam. Shri Modi paid homage to Ho Chi Minh, laid a wreath at the Monument of National Heroes and Martyrs and visited the Quan Su Pagoda. PM Narendra Modi visited Mozambique, South Africa, Tanzania and Kenya from July 7-11. PM Modi held deliberations with President Filipe Nyusi of Mozambique, South African President Jacob Zuma, President John Magufuli of Tanzania and President Uhuru Kenyatta of Kenya. PM Modi’s four-nation tour strengthened India’s ties with the African mainland in areas of trade, energy and defence and maritime cooperation. PM Modi had a bilateral meeting with the Swiss President Johann Schneider Ammann where Switzerland supported India’s bid to NSG. He also attended a meeting with the business leaders to enhance industry and trade relations between India and Switzerland. PM invited Swiss industrialists and business leaders to explore opportunities that India presented today. PM Modi visited Qatar on June 4th. He met top business leaders in Qatar to enhance industry and trade relations between both countries. PM invited the business leaders to invest in India. PM met Emir of Qatar, Sheikh Tamim Bin Hamad Al Thani and PM Abdullah bin Nasser bin Khalifa Al Thani and held wide ranging talks to enhance the bilateral relations and trade ties between the two countries. PM also interacted with Indian workers in their camp in Doha and shared snacks with them. He also interacted with Indian Community members in Doha. Prime Minister Modi visited Afghanistan on June 4th. Shri Modi jointly inaugurated the Afghan- India Friendship Dam with President Ashraf Ghani. PM also shared his views on the progress India was making and said that the world was seeing an India full of opportunities. PM was awarded with Amir Amanullah Khan Award, highest civilian honour of Afghanistan. PM Narendra Modi visited Saudi Arabia on 2nd and 3rd April. Shri Modi met and held talks with H.M. King Salman bin Abdulaziz Al Saud and other important members of the Royal family. The Prime Minister also attended a business event in Riyadh. He visited the Masmak Fortress, reached out to the workers at ‘L&T Residential Complex. The PM also visited the TCS All Women IT & ITES Center in Riyadh. The visit helped in deepening the bilateral relations and strengthening business ties between India and Saudi Arabia. In a special gesture, Shri Narendra Modi was conferred Saudi Arabia's highest civilian honour, Sash of King Abdulaziz Sash (Special Class). PM Modi visited Malaysia from November 21to 23. He attended the ASEAN-India Summit and the 10th East Asia Summit. PM Modi met PM Najib Razak of Malaysia and discussed bilateral ties with him. Shri Modi and Mr. Razak jointly inaugurated the Torana Gate. The PM also visited Ramakrishna Mission and inaugurated a statue of Swami Vivekananda. Shri Modi interacted with Corporate Malaysia and invited them to invest in India. PM Modi also interacted with the Malay-Indian community during his visit. The PM also held bilateral meetings with Premier Li Keqiang of China and PM Shinzo Abe of Japan on the sidelines of the summits. On 6th July 2015 the PM Modi embarked on a tour to Central Asia. He visited Uzbekistan, Kazakhstan, Turkmenistan, Kyrgyzstan and Tajikistan. The visit was historic and special because it was a significant effort to expand India’s cooperation with the Central Asian Nations on an unprecedented scale. 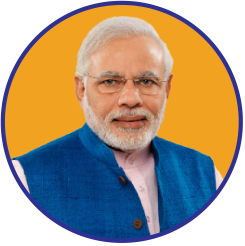 Prime Minister Shri Narendra Modi visited Bangladesh on the 6th & 7th June 2015. PM Modi held talks with PM Sheikh Hasina and there were signing of multiple MOU’s. India & Bangladesh also signed the Land Boundary Agreement cementing both of the countries relations further. Shri Modi also participated in the ceremony of the unveiling of plaques of the Grant-in-Aid projects. He paid tributes at the National Martyrs’ Memorial and paid homage at Bangabandhu Memorial Museum.He also visited the Sree Dhakeshwari National Temple and the Ramakrishna Mission. PM Modi's visit to Mongolia was historic, path breaking & one that will take India's ties with Mongolia to spectacular heights. One-day visit by the Indian PM to the land of spiritual neighbour opened up broad avenues of partnership and cooperation between both the Nations. Prime Minister Narendra Modi visited Canada from April 15th - April 16th. This was first standalone bilateral visit by an Indian Prime Minister in over four decades. Shri Modi held wide-range meetings with the Canadian counterpart Mr. Stephen Harper. The Prime Minister met top business leaders and industrialists in Ottawa and Toronto to deepen ties between both the nations. PM Shri Modi also addressed the Indian Diaspora in Toronto and paid a visit to Gurudwara Khalsa Diwan and Lakshmi Nayan Temple in Vancouver. PM Modi visited Seychelles, Mauritius & Sri Lanka from 11-14 March 2015. The visit was successful in strengthening India’s ties with these friendly Nations. In Seychelles, PM met President Michel and held multiple deliberations with him. In Mauritius, PM addressed the Mauritius National Assembly and joined the ceremony to mark the commissioning of the Barracuda. In Sri Lanka the PM addressed the Parliament, visited the Mahabodhi Society and travel to Jaffna. The visit was the first bilateral visit by a Prime Minister of India in 28 years. PM Modi attended the G-20 Summit in Brisbane followed by a state visit to Australia during which he also addressed the Australian Parliament. The visit was the first bilateral visit by a Prime Minister of India in 33 years. Shri Modi addressed the Parliament of Fiji. PM Modi also attended a 'Forum for India-Pacific Island cooperation' where he met leaders from Pacific islands nations. The Prime Minister travelled to Brazil to attend the BRICS Summit in Fortaleza. The PM held extensive meetings with the other BRICS leaders and the leaders discussed a wide range of global issues. During the Summit it was decided to set up a BRICS bank and the first head of the Bank will be from India. 3 MoUs were signed between Brazil and India, after President Rousseff and PM Modi met. The Prime Minister also met leaders of various South American nations during the visit. PM Shri Narendra Modi embarked on his first ever foreign visit after assuming charge as PM to Bhutan. This is indicative of the importance India attaches to ties with Bhutan. During the visit the Prime Minister met the King of Bhutan, King Jigme Khesar Namgyel Wangchuck and PM Tshering Tobgay. The PM addressed the Parliament of Bhutan and also inaugurated the Supreme Court building, which was built after receiving funding from the Indian government.